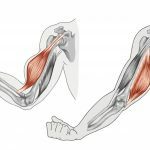 In this post, I want to look at the two types of exercises that make up all resistance training workouts: multi-joint (MJ) and single-joint (SJ) exercises. What is the difference between them, is one type superior to the other, and when should we be doing both? Let’s begin by defining our terms and giving examples. A single joint is exposed to a resistance that provides a significant stimulus intended for the muscles responsible for one joint action. For example, there are four possible joint actions at the knee: flexion, extension, internal rotation and external rotation. 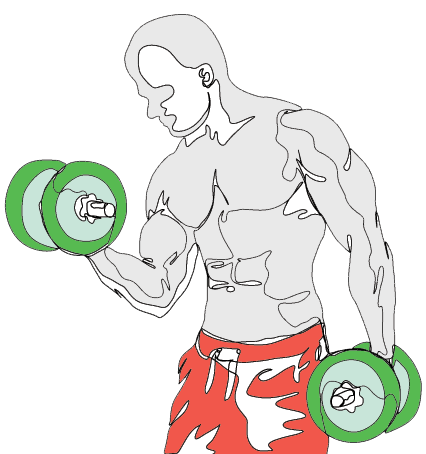 A SJ exercise will target the muscles responsible for creating the movement of one of these joint actions. Correct positioning and target joint for the knee extension (sometimes called leg extension). The SJ knee extension exercise engages the quadriceps femoris: the quadriceps act on the knee joint and receive the hypertrophic/strengthening stimulus. The knee extension is a single-joint exercise. Two or more joints are exposed to a resistance that provides a significant stimulus to the muscles responsible for creating movement at those joints. A good example of a multi-joint exercise is the leg press, where the hip, knee and ankle joints are exposed to significant resistance. Although the targeted prime mover of the leg press exercise is the hip joint’s big muscle: the gluteus maximus, other hip, knee and ankle joint muscles are involved too. Synergist muscles include the quadriceps (knee joint), adductor magnus (hip joint) and the soleus (ankle joint). Then, there are the muscles that act as dynamic stabilizers: the hamstrings (knee joint) and gastrocnemius (ankle joint). The leg press is a multi-joint exercise. The SJ knee extension exercise provides stimulus to one muscle group: the quadriceps. Whereas the MJ leg press exercise engages much more muscle: the gluteus maximus, plus an additional two muscle groups and three more separate muscles. If the level of stimulus provided to all the muscle groups involved in a leg press is great enough to produce the desired outcome, then it would be vastly more efficient than a collection of SJ exercises to target the same areas. This is one of the arguments in favour of MJ exercises, that they stimulate much more muscle per unit of time than SJ exercises. As one of the main barriers to exercise adherence is time, MJ exercises have the potential to keep more people resistance training (RT) with a minimal time investment. Do MJ exercises alone provide enough of a stimulus for optimal strength and hypertrophy? To start with the counter position, some research has indicated that SJ exercises might increase muscle activation in certain muscle groups in comparison to MJ exercises, and therefore SJ exercises may provide a better stimulus for hypertrophy for those muscles. However a review of the relevant literature published in 2017, suggests that there is no difference in terms of strength and hypertrophy outcomes between performing MJ or SJ exercises alone, and additionally there is no extra benefit in adding SJ exercises to a MJ exercise program. There was an exception to the rule: the researchers did find support for including specific SJ exercise for the lumbar extensor muscles. It is worth noting that the researchers make a point of stating that SJ exercises can be useful for correcting muscular imbalances. Research also suggests that muscle thickness does not increase when a person adds SJ exercises to a routine that already consists of MJ exercises. It is still useful to remember that SJ exercises do have the potential to increase strength and possibly hypertrophy in a particular region of a muscle, or in an individual muscle of a muscle group that receives less of a stimulus with a particular MJ exercise. It may however also be the case that simply adding a greater variety of MJ exercises would achieve the same result. Another benefit of workouts consisting of MJ exercises is their impact on the CV system and improvements in measures such as VO2 max. A recent research paper showed that routines consisting of only MJ exercises were more efficient at improving not only muscle strength but also VO2 Max, than routines consisting of only SJ exercises. Whilst the Big Five routine as outlined in Body by Science (McGuff and Little) may not quite be the be all and end all, it is a mighty fine starting place and somewhere not to deviate too far from. Tweaks to the Big Five routine such as using different hand grips and stances for certain exercises (within the realms of proper muscle and joint function/movement) will, according to the current research, enhance long-term strength and hypertrophy adaptations. These are just some of the options available to add MJ exercise variety to the Big Five. And this is without even considering free weight or body weight options possible too! Providing psychological satisfaction of honing-in on a desired/sought after muscle. Multi-joint exercises mean multiple muscles receive stimulus in one exercise, this makes them efficient, and it appears that MJ exercises alone may be enough for optimal strength and hypertrophy. This is of particular value when looking to engage (and keep engaged) individuals who want or need to minimize their time spent exercising. Whenever possible, it is advisable that all routines are underpinned with MJ exercises. It is also a good idea to use a wide variety of MJ exercises including simple adaptations to key exercises such as stance and grip changes. Don’t throw the baby out with the bath water though! Remember that SJ exercises still have a value and the personal trainer in particular needs to understand when and for whom SJ exercises are most needed. 2. Fonseca, R. M., Roschel, H., Tricoli, V., de Souza, E. O., Wilson, J. M., Laurentino, G. C., Ugrinowitsch, C. (2014). Changes in exercises are more effective than in loading schemes to improve muscle strength. The Journal of Strength & Conditioning Research, 28(11), 3085-3092. 3. Gentil, P., Soares, S. R. S., Pereira, M. C., Cunha, R. R. D., Martorelli, S. S., Martorelli, A. S., & Bottaro, M. (2013). Effect of adding single-joint exercises to a multi-joint exercise resistance-training program on strength and hypertrophy in untrained subjects. Applied Physiology, Nutrition, and Metabolism, 38(3), 341-344. 4. Gentil, P., Soares, S., & Bottaro, M. (2015). Single vs. Multi-joint resistance exercise: effects on muscle strength and hypertrophy. Asian Journal of Sports Medicine, 6(2). 5. Gentil, P., Fisher, J., Steele, J. A (2017). Review of the Acute Effects and Long-Term Adaptations of Single- and Multi-Joint Exercises during Resistance Training. Sports Med. 2017 May;47(5):843-855. doi: 10.1007/s40279-016-0627-5. 6. Mendiguchia, J., Garrues, M. A., Cronin, J. B., Contreras, B., Los Arcos, A., Malliaropoulos, N., & Idoate, F. (2013). Nonuniform changes in MRI measurements of the thigh muscles after two hamstring strengthening exercises. The Journal of Strength & Conditioning Research, 27(3), 574-581. 7. Paoli, A., Gentil, P., Moro, T., Marcolin, G., Bianco, A. (2017). Resistance Training with Single vs. Multi-joint Exercises at Equal Total Load Volume: Effects on Body Composition, Cardiorespiratory Fitness, and Muscle Strength. Front Physiol. 2017; 8: 1105.